This stylish 2013 custom built home is located on a family friendly street, backing onto a quiet park and just a short walk to all the wonderful amenities Bronte Village has to offer. Enjoy a night out at some of Oakville’s best gourmet restaurants and cafes, take in a Leafs game over beer & wings at a local pub, or shop for that special someone at one of Bronte’s many antique and craft stores. Bronte offers a wonderful pedestrian lifestyle like no other; enjoy ice cream as you stroll along the pier, get your feet wet in the sand at Bronte beach or explore the miles of walking and cycling trails, Bronte has it all! This 4 bedroom, 4.1 bath home was built to the owners exacting standards and boasts 3,715.7 sq ft of finished living area (per builders plans). The home features choice finishes with custom millwork, deep crown moulding, 10’ baseboards, white oak hardwood and LED pot lighting used extensively throughout. The built-in theatre style sound system and tasteful light fixtures add an elegant vibrancy with nine, ten and twelve foot ceilings heights. The entrance to this luxury home begins with a dramatic foyer with six point chandelier, two closets and 12' ceiling heights. The wonderful open floor plan provides great flow through the living room, dining room and kitchen - providing the perfect space for entertaining. Enjoy the gorgeous eat-in gourmet kitchen with superb attention to detail including; custom wood cabinetry, breakfast counter, soft close dove tailed drawers, massive mahogany centre island, granite counter tops, GE Monogram appliance package with double oven, 4-inch commercial style gas cooktop and commercial grade 1200CFM mahogany custom hood. The great room, featuring 12' ceilings, has a fabulous wall of windows and sliding glass door which floods the room with sunshine and provides access to a spacious glass enclosed deck. The two piece powder room and storage closet complete the main level. The splendour continues on the second level with an open landing, spacious master bedroom featuring vaulted 12' ceilings and walk-in closet with custom built-in’s. 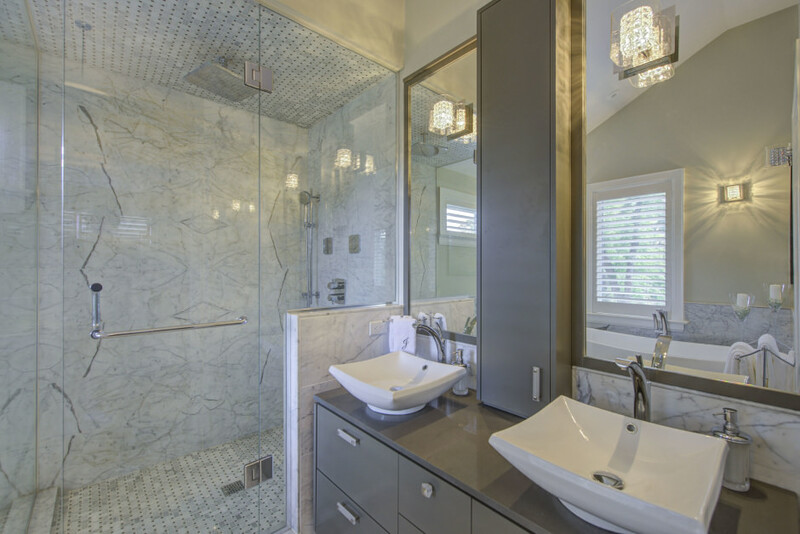 The sumptuous master ensuite features his & hers vanity sinks, standalone soaker tub, and seamless glass shower with separate wand, water jets and marble surround. The second bedroom also features vaulted 10' ceilings, reach-in closet and thee piece ensuite. The remaining two bedrooms are both generous in size. The main four piece bathroom and laundry room complete the second floor. The fully finished lower level includes LED pot lights, large oversized windows, exercise area, spacious open recreation room with build-in theatre style sound, cold room, utility room and three piece bathroom. 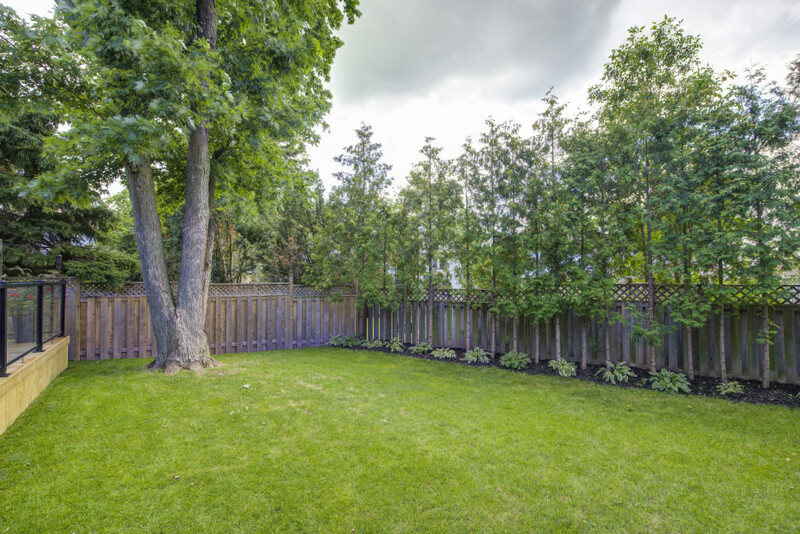 The fully fenced and private pool size yard surrounded by mature cedars, 2-car garage and oversized drive providing parking for four cars completes this wonderful family home. Additionally, the home includes two furnaces, two air conditioning units, central vacuum, security system, a phone in each room, and is wired for CAT5, satellite and cable. Located just a short walk to the beach, harbour and all the wonderful shopping and restaurants Bronte Village has to offer!